Eagerly awaited, here it finally comes : a new Christmas Stocking ! 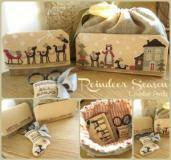 A Season project - kept secret - that you will discover in your letter box in December. This year, it is a full set of 3 stitching smalls !!!! To be stitched over one on 32ct sandstone linen. French is the default language for finishing instructions. If you want English instructions, please select the option below. Instructions will not be changed once your order has shipped out !